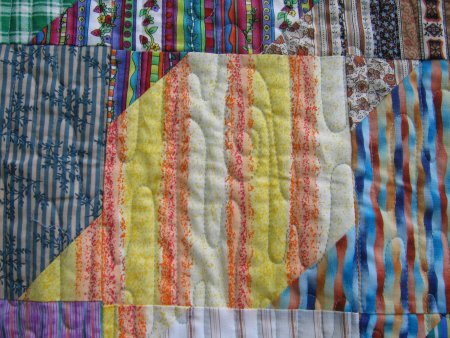 In September 2003, Colleen Case of About.com's Quilting forum started a swap of 10" striped fabric swap. 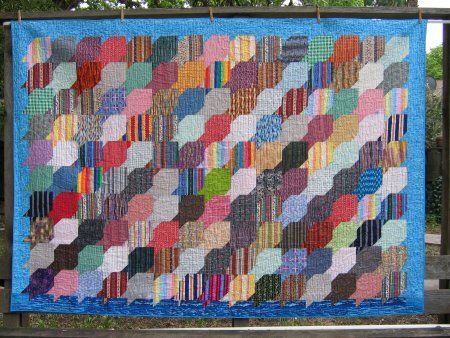 Normally I wouldn't have participated for two reasons: 1) I don't particularly like stripes 2) I tend towards strip piecing, so 10" squares doesn't fit in with my quilting style and 3) I didn't NEED any new projets! However, against my better judgement and for no good reason at all, I'd decided to participate. Since stripes aren't my favorite design it fairly begged the question: why do I have so many in my stash??? What was I thinking? But it sure was exciting getting all those wonderful squishies in the mail! :-) Now all I needed was an idea of how to USE the 10" squares effectly. Providence seems to step in at the right moment in time ... the November 2003 issue of "The Quilter Magazine" had the PERFECT quilt for me to make with the swap fabric. On page 80, there is a quilt titled, "Charm School" and is made up of tessellating fish, all going in the same direction, so it looks like a school of fish. Now, I like tessellating patterns so it caught my eye right off the bat. The kicker was that the yardage calls for the use of 10" squares!!! My goodness ... how much more perfect can you get?? The quilt in the magazine is only 44"x56" and since I have more striped fabric in my stash (*where* did it come from??? remember ...I don't even CARE for stripes! ), I made my striped fish quilt larger by augmenting the swapped striped squares with fabric from my stash. It was during a weekend visiting Catherine at college in San Luis Obispo that I constructed the top. I arrived Thursday evening and to occupy myself during the day on Friday while she was in class, I sorted and cut and sewed columns of tessellating fish. Her apartment (more of a studio loft) was festively decorated with my long strips of striped fish blocks by the time she got home. When I returned home, I sewed all the columns together into the top. And there the to sat .. just like all the OTHER tops I had constructed but never quilted. Once again, since the quilt was big enough to be useful (twin size), it was too big for me to stuff through my home sewing machine. Fast forward to March 2006. I'd been on a roll to get my tops quilted .. to actually get some quilts made, even if it ended up costing me some bucks to do it. I brought the top & backing over to Janna Bailey of The Quilting Company, once again asking for her water ripple quilt motif. And why, you might ask, is this a school of SLO fish? I love puns. I especially love awful puns. Well.. SLO is the abbreviation for San Luis Obispo and pronounced exactly as you might think it was "slow". And what do fish congregate in? Schools! And where was I that weekend? At Catherine's school! I love it when things come together so nicely!